Not only am I sort of underwhelmed here (no criticism, but I’ve been through this agenda many times before), but I wanted to blog about my latest finished object: more socks! Aaaannnyyyway…the socks were knit top down using the general “recipe” and garter rib pattern from Charlene Schurch’s Sensational Knitted Socks book. I started these after I took the sock knitting seminar from Lucy Neatby (also through the Windy City Knitting Guild), so I incorporated some of the techniques I learned: the garter stitch heel and the garter stitch toe. 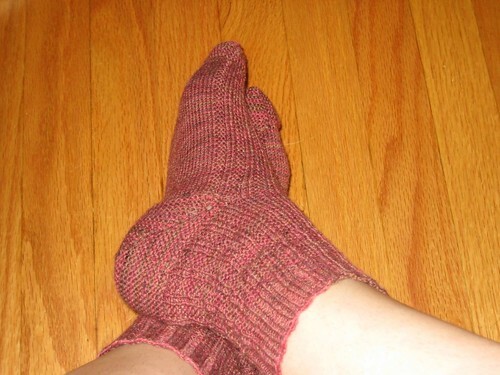 I figured with a garter rib pattern in the “body” of the sock, the garter stitch heel and toe would fit in nicely. According to Lucy, the garter stitch in the heel and toe are more durable. The heel is knit from the other end of the yarn ball, so it is possible to replace the heel later if there is a lot of wear, too. While I haven’t noticed a lot of wear and tear on the heels of my handknit socks, I have noticed it on my store-bought ones. So, we’ll see how this heel wears compared to the typical slip stitch and stockinette heels I’ve worked before. One final note about these socks…I began sock #2 on the second segment of my return flight from Hyderabad, India (the Frankfurt to Chicago flight, to be exact) and completed it through the heel turning. I guess I’m impressed with how much knitting I can do when I have 8 hours of uninterrupted knitting time. I’m going to start a pair of Widdershins socks next. I’m really intrigued by incorporating a heel flap in a toe-up sock. I just have to master the cast on technique first. If it seems like I (and others) are knitting a lot of socks lately, that’s probably because they are such a fabulous summer project. Not only are they highly portable (making them my favorite commuting project), but working on socks doesn’t involve having heaps of knitted fabric resting in your lap. Even if that fabric is cotton or linen, it can get pretty annoying when the humidity and thermometer are soaring. I bet you didn’t know that I harvested my first homegrown tomatoes yesterday, did you? I don’t eat them (they smell evil to me), but Mark said the one he ate was delicious. I would attempt to photograph one of the beautiful tomatoes and post the photo here for you to admire, but see my previous nasty comment about Blogger and photos.